The use of software in science has become pervasive throughout the research cycle. If we agree that software is critical to research and scholarship, why have we been slow to change our practices and rewards its creation and ongoing development and support? This session will frame the issues and provide an overview of the day. 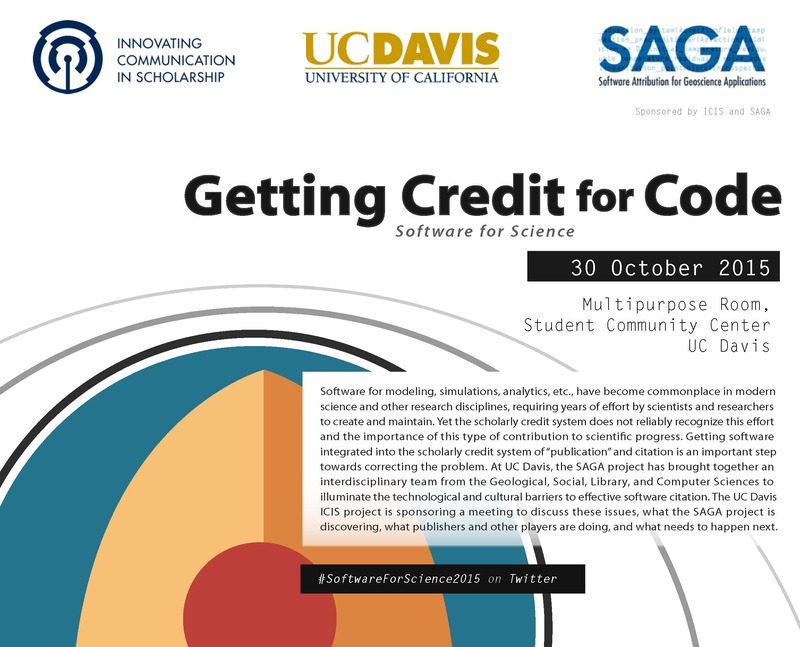 The UC Davis SAGA project is exploring the problem of academic credit for software used in the geological sciences. This session will report out on findings for both infrastructure and practices available to projects that generate scientific software, and attitudes about what it needed and possible from a range of stakeholders working in geophysics. Several interesting projects have explored this topic over the past few years, involving key organizations like GitHub, CrossRef, PLoS, and Zenodo. This session will describe and discuss those efforts and what we’ve learned from them. Clearly progress will be hindered unless publishers and information resource companies are involved in making software count, both as a recognized form of scholarship and as part of the scholarly credit ecosystem (e.g. included in citation databases and metrics systems). This session will focus on how publishers and other companies are thinking about software in relation to publications and other forms of scholarship beyond the research article. If the first step is to admit we have a problem, what are the next steps we must follow? Where do we want to go from here? Are there specific changes or experiments to be done that would advance things right now? What specific measures can be undertaken? What research needs to be done? The closing session will discuss these questions and develop a plan of action.